Over period of time lot of problems can emerge like slowness, crashing, unwanted toolbars while using web browser. Instead of complex troubleshooting steps, one can easily fix such issues by resetting web browser to factory default settings. Besides ability to reset Google Chrome to default settings, upcoming version of Firefox browser support one click feature to reset Firefox to factory default settings. Reset Firefox feature will create new profile (folder) there-by eliminating any existing conflicts and bottlenecks. While your new profile is created, it does save existing: Bookmarks, Browsing history, Passwords, Cookies and Web form auto-fill information. However, reset feature does make you loose other important elements including: extensions, themes, open tabs, windows, tab groups, personal dictionary, site-specific preferences, search engines, toolbar customizations, download actions, DOM storage, security device settings, download history, user styles, security certificate settings and plugin MIME types. As of now, Reset Firefox feature is only available in beta version of Firefox. You may download Firefox beta from mozilla.org/beta website to test drive this feature. Should be available in upcoming stable release of Firefox browser. 1. 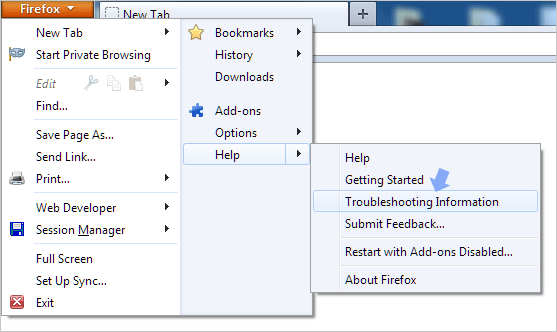 Open Firefox browser, then click on Firefox button and goto Help > Troubleshooting Information. Alternatively, you can type about:support in the address bar to directly open troubleshooting information page. 2. Then click Reset Firefox button at top right part of the page. 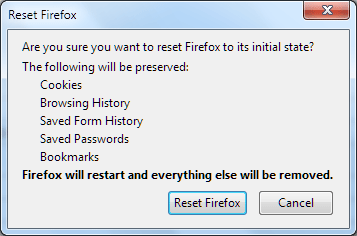 Click on Reset Firefox on the confirmation windows to proceed with reset routine. 3. Firefox will automatically close to perform reset routine. Once reset is complete, you will see window showing items restored by reset procedure. Click Finish to complete reset and your all new Firefox browser (with default factory settings) should open.